ASRAAM is a fast, highly agile, fire and forget IR missile for short range air-to-air combat, able to counter intermittent target obscurity in cloud and severe Infra-Red countermeasures. It is carried on Tornado F3, Harrier GR7/9, and the Typhoon. It will replace Sidewinder AIM-9L albeit that this will remain in service in parallel for a period. The programme cost some £857m. There were considerable technical problems and delays before service entry in 2002. The Sidewinder missile, which is carried by all the RAF combat aircraft as well as the Hawk and Nimrod MR2, is an infra-red weapon which homes onto the heat emitted by a hostile aircraft's engines. Sidewinder can operate independently of the aircraft's radar, and provides the air-defence aircraft with an alternative method of attacking targets at shorter ranges. Sidewinder has an excellent dogfight capability. AMRAAM (Advanced medium-range air to air missile) is a US air fighting weapon that matches the fire and forget capability of the ASRAAM, but with greater range. There is increased immunity over electronic countermeasures and a low smoke, high-impulse rocket motor to reduce the probability of an enemy sighting the missile. 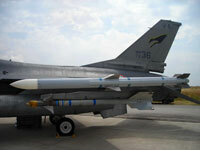 This system is in use by Tornado F3, and will be used by the Typhoon. AMRAAM has been in service with the Fleet Air Arm since 1995, and the initial purchase was believed to be some 210 missiles worth some £50m. In 2004 Raytheon Missile Systems was awarded an £80 million contract by the UK MoD for the AIM-120 C5 variant. Having entered service in 2007 the new missile, includes a greater immunity to countermeasures, longer range and a more powerful warhead. The C model has replaced the earlier B model. The Beyond Visual Range Air-to-Air Missile (BVRAAM) (also known as Meteor) should provide Typhoon with the capability to combat projected air-to-air threats and sustain air superiority throughout the life of the aircraft. The weapon is required to operate in all weather conditions and will complement the Typhoon Advanced Short Range Air-to-Air Missile (ASRAAM). 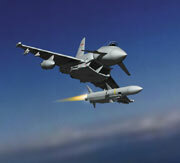 Until Meteor enters service, Typhoon will be armed with the Advanced Medium Range Air-to-Air Missile (AMRAAM). Meteor is a collaborative programme with 5 partner nations; Germany, Spain and Italy (for Typhoon), Sweden (for JAS 39 Gripen) and France (for Rafale). The UK MoD expects a fully developed missile standard ready for delivery and platform integration in 2012 and the first front-line Typhoon unit declared Meteor capable in 2015. The overall cost is projected at £1.4 billion.